Protestors chant and hold up ballot papers with the proposed question for a referendum on breaking away from Spain during a rally in favour of a planned referendum on the independence of Catalonia in Madrid, Spain, September 17, 2017. BARCELONA - Spanish authorities on Sunday pursued efforts to block an independence vote in Catalonia, seizing campaign materials as the chief prosecutor said jailing the region’s top politician could not be ruled out. The government in the northeastern region is intent on holding a referendum on October 1 that will ask voters whether they support secession from Spain, a ballot Madrid has declared illegal. In a raid on a warehouse in the province of Barcelona on Sunday, police confiscated around 1.3 million leaflets and other campaign materials promoting the vote issued by the Catalan government. The haul was the largest in a series of similar raids, the Interior Ministry said in a statement. 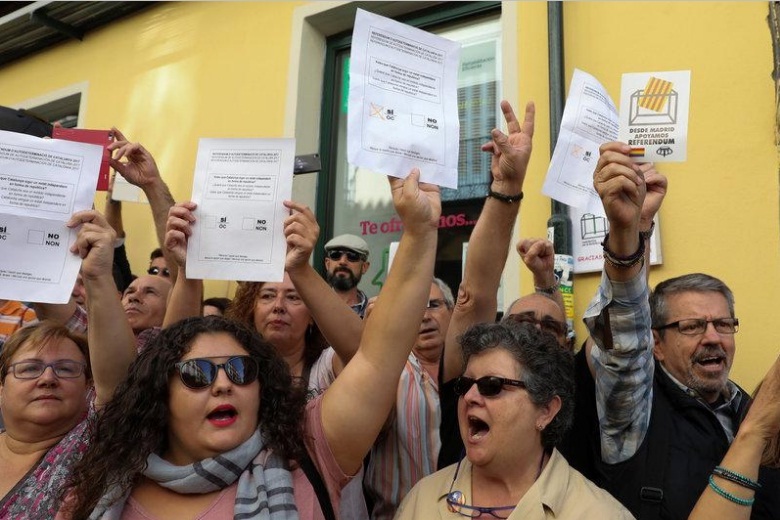 Spanish prosecutors, who have ordered police to investigate any efforts to promote the plebiscite, said last week that officials engaged in any preparations for it could be charged with civil disobedience, abuse of office and misuse of public funds. More than 700 Catalan mayors gathered in Barcelona on Saturday to affirm their support for it. Asked if arresting regional government head Carles Puigdemont was an option if preparations continued, Spain’s chief public prosecutor said in an interview: ”We could consider it because the principal objective is to stop the referendum going ahead. “I won’t rule out completely the option of seeking jail terms... It could happen under certain circumstances,” Jose Manuel Maza was quoted as also telling Sunday’s edition of newspaper El Mundo. The Catalan parliament passed a law enabling the referendum early last month, but Spain’s Constitutional Court suspended it the next day. Pro-independence activists have said they plan to distribute campaign leaflets promoting the referendum on Sunday evening in Barcelona. Although polls show less than half of Catalonia’s 5.5 million voters support independence, most in the wealthy northeastern region want the chance to vote on the issue. Spanish authorities on Sunday pursued efforts to block an independence vote in Catalonia, seizing campaign materials as the chief prosecutor said jailing the region’s top politician could not be ruled out. The government in the northeastern region is intent on holding a referendum on October 1 that will ask voters whether they support secession from Spain, a ballot Madrid has declared illegal.